Kent County parents are probably familiar with Big Oak Park, located in Smyrna, DE, as it is one of the three major parks in the county. I’ve already covered the other two, Brown’s Branch and Brecknock, so I couldn’t hold off on posting about Big Oak any longer! For anyone unfamiliar or for those who are passing through Kent County, this park is the easiest to access from Rt. 1 via. the South Smyrna exit, and you can actually see it from the highway. It would make a great pit stop if you are traveling through Delaware as it has a picnic pavilion AND bathrooms! We probably stop at this park every other week or so year round because it is only a few minutes from our house and is on the way home from daycare. Because we are frequent visitors, I have a zillion pictures of the kids there throughout the seasons and D’s first time in a swing was at Big Oak! Expansive grassy areas, soccer fields, baseball fields, two space themed playgrounds (one for big kids and one for toddlers,) a rock climbing wall, a nature trail and a butterfly garden are just a few of the attractions you can expect to find here. 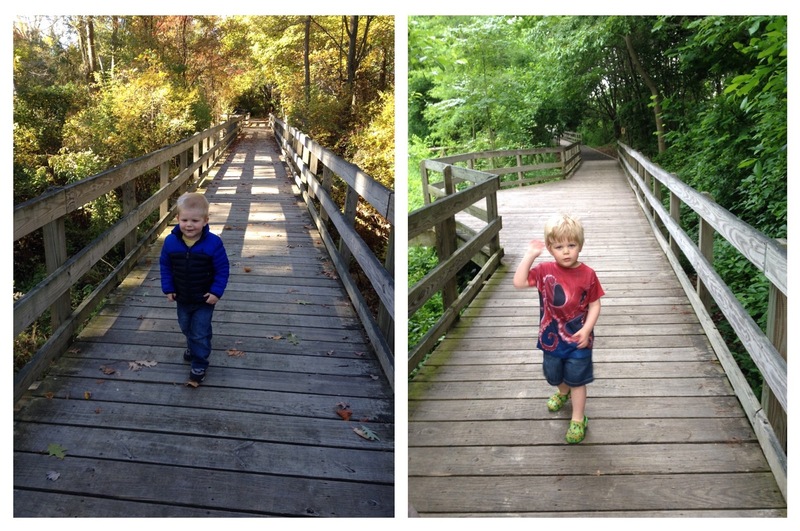 I really love the nature trail, and it’s short enough that little ones can walk it on their own without getting too tired. The majority of the trail is on a boardwalk through the woods that overlooks a small creek. We are always on the lookout for wildlife and have spotted little lizards and even a snake here before! In the Spring, one of my favorite native plants blooms along the pathway, the jack-in-the-pulpit. In the Summer, the sweet smell of honeysuckle fills the air and in the Fall we have fun collecting all the different types of leaves that have fallen on the ground. Since we go to Big Oak so often, I tend to get bored just visiting the playground. I also like to explore the areas that are a little farther out from there which include another boardwalk over a marsh and the butterfly garden which can be found behind the white building in the back of the park. We’ve enjoyed seeing tadpoles flit around in the marsh area in the warmer months. As you walk along the pathway to the butterfly garden, you will find a composting demonstration, a bench with Ronald McDonald, (a little creepy…) a dinosaur statue, a pirate ship and the adorable butterfly benches in the garden that are the perfect photo op! 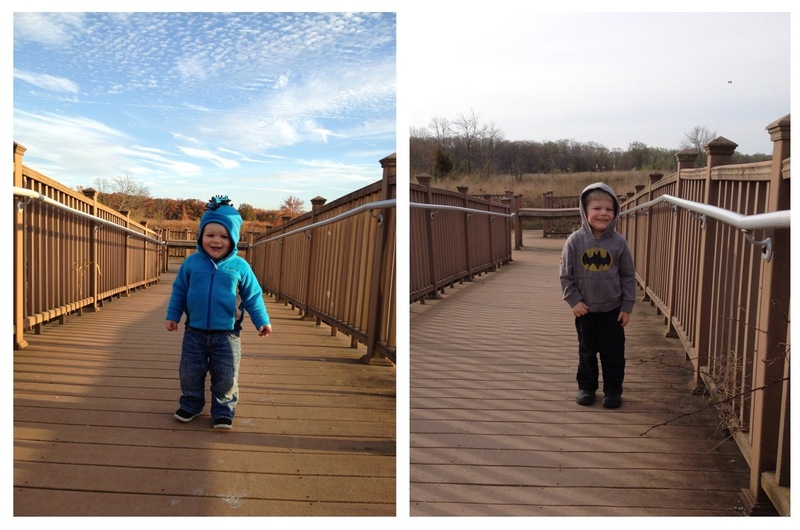 To be honest though, D’s favorite thing to do at the park is collect all the rocks in the pathway. He could do that for HOURS! If you are like me, you may have wondered what the heck is in that huge modern building that you pass by at the entrance to Big Oak Park. I have the answers for you AND a bit of a secret too! That building is home to the Delaware AeroSpace Education Foundation, or DASEF for short. I highly recommend visiting their website, especially if you have school aged children because they offer some really cool educational programs. Some of your kids may have already experienced these programs at their school or are on the calendar for 2016 so make sure you check that out. Now for the big secret…they hold birthday parties in this building!!! And not just any old birthday parties, themed ones with educational activities!!!! I know as parents, we are always trying to find somewhere new and exciting to have a party that everyone else hasn’t done ten times over. If I hadn’t already just booked my son’s 4th birthday somewhere else, I’d be all over that dino party. I guess I will have to save it for next year, but you guys should totally check it out for your child’s upcoming birthday. If you do end up booking one there, please let me know how it is, I’m dying to find out! For information about events at Big Oak Park, make sure you follow the DASEF Facebook page: DASEF on Facebook! 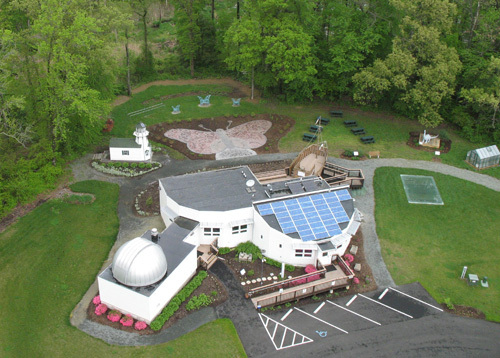 Great shot from the DASEF website of the butterfly garden, dinosaur, pirate ship and environmental outpost building.